The weather is getting colder and things you would never eat in the summer become a fixation, chicken and dumplings, pot roast, and of course chicken pot pie. You can prep this the day before and bake the next day. It is a dish packed with flavor and good stuff. The trick for this pie is chopping everything into small pieces. The chicken can be chopped into large bitesize pieces. You can use roll out dough or make your own pie crust. 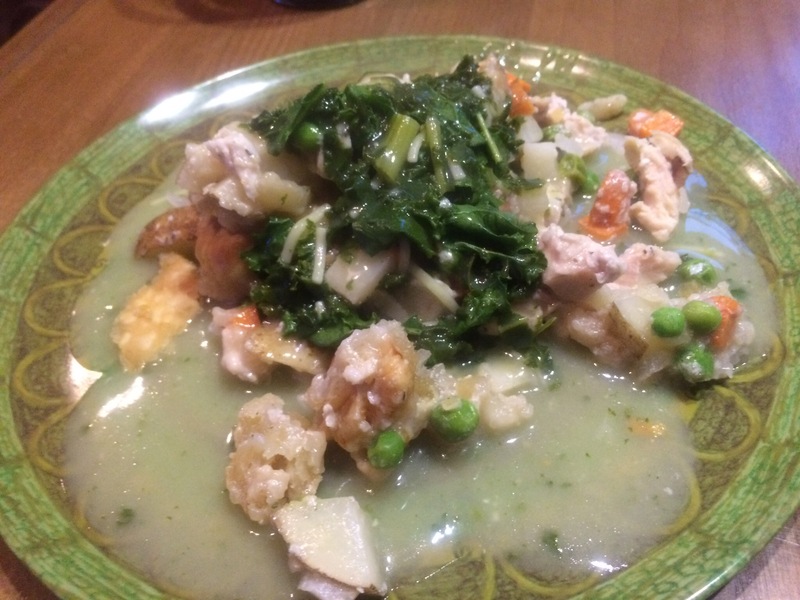 I make the chicken kale gravy to top it with….see previous post. Heat oven to 350, cut vegetables into small pieces and chicken into big bite hunks. Place into large bowl, add peas, sherry, flour, salt and pepper and stir until well coated. Place pie dough in the bottom of pie pan, scoop mixture into pan, top with remaining pie dough. Crimp edges, you can egg wash the top if you choose too. ( whipped whole egg brush on with pastry brush) sprinkle top lightly with some garlic salt or powder. Bake for 1 hour or until crust is golden brown. Service with chicken kale gravy. Mix flour, lard and salt……cut with knife or fork. A tablespoon at a time add water to mixture, after two tablespoon mix with your hands. If it sticks together you do not need additional water, if not add one more. Forming a ball, divide in half and roll out on a floured board. Do the same for the upper half. Carefully placing in on the pie.